Berkeley Hall Club in Bluffton, S.C. is an incredible facility. The two Fazio courses are demanding enough to host the best amateurs in the country each year at “The Players Amateur,” but enjoyable enough that the national membership makes plays year round. The course is maintained to the highest standards, and the “Berkeley Hall Experience” comes with the expectation of facilities and service at the highest level. 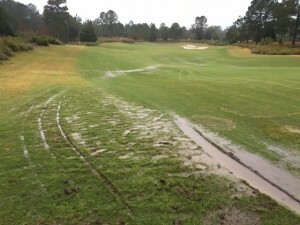 A wet winter in 2016 was keeping Chris Young, CGCS and “Director of Golf Maintenance,” from providing the product that he knew was expected from the membership. He contacted Pat O’Brien, regional agronomist with the USGA, and Pat suggested that he contact TDA. Dennis Hurley and Mickey McCord prepared a plan in February of 2016. The plan reviewed every hole on the facility, and addressed the issues that were causing the saturated fairways. The plan utilizes the large well-built infrastructure that existed on the property. Every well-designed drainage system must consist of a collection and a transportation component. The existing pipe size was of adequate size and depth to handle the transportation of all surface and seepage water on the property. What didn’t exist was an adequate collection system. The existing system had well placed inlets in the low areas. The TDA plan called for the addition of surface inlets higher in the watershed to reduce the concentrations of flow, and most importantly, large seepage fields to remove the seepage water off of the profile. The seepage fields utilized Turf Drain, which has 45x more airspace per linear foot than 4” perforated pipe. The contractor on the project is Turf Drainage Co. of Florida. Mike Smith has been installing TDA designs since 1991. Chris has members of his crew working in conjunction with Mike’s drainage crew. 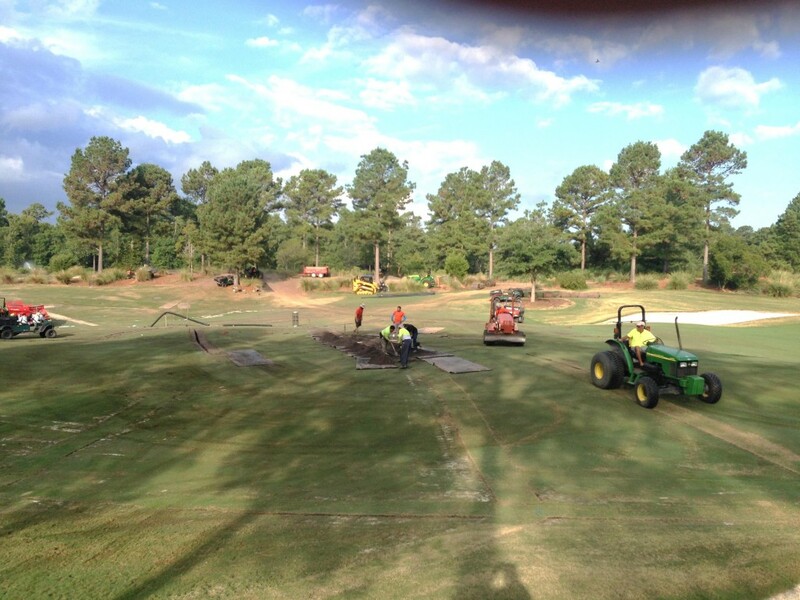 Chris’ crew handles the removal and replacement of sod, as well as potholing irrigation. The teamwork has been amazing and the production has been outstanding. By the end of the year, there was over 50,000 feet installed and over 225 drain inlets. Most importantly the results were exactly what the club was hoping for. Chris says that the members know exactly which holes have been drained. It is the holes that they are “off the paths.” Chris tells the story with pride that the people that stayed during Hurricane Mathew were anxious to check out the drainage after 18 inches of rain fell in a 36-hour period. They took a utility vehicle out on the course and couldn’t believe that they could drive down the fairway without leaving tracks. What really amazed Chris was several weeks after the hurricane, the rest of the golf course suffered from an explosion of nutsedge, but the holes that had been drained prior to the storm did not require a herbicide application. Anxious to check out the drainage after 18 inches of rain fell in a 36-hour period. They took a utility vehicle out on the course and couldn’t believe that they could drive down the fairway without leaving tracks.